at this season of the year when many of us are building special holiday displays. 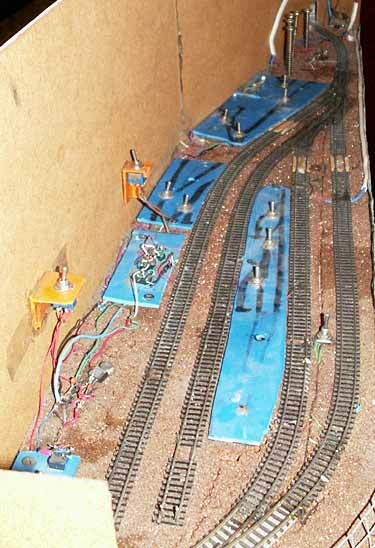 more elaborate circuits, including Gary Irwin’s On30 Christmas layout (shown above). Bachmann’s wildly successful On30 trains (1:48 running on 16.5mm gauge) were originally commissioned and designed to provide animation for the well-known Department 56 ceramic villages. 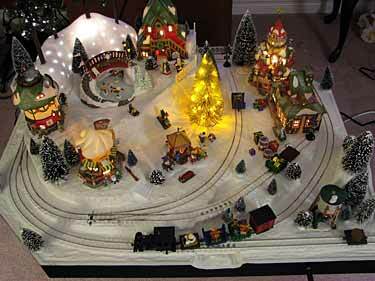 Gary Irwin, from London, Ontario Canada, has returned to the Bachmann roots, building his 41x33in (104x84cm) On30 Santa’s Toyland Express using his collection of Department 56 North Pole Series Christmas ornaments as scenic elements. The results have a magical quality, as illustrated in our title photograph at the top of this page! 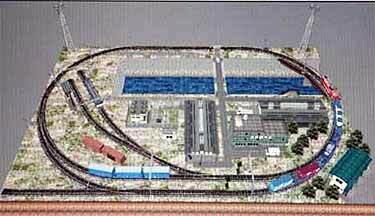 This is Gary’s first small layout. Influenced in part by this website, he moved up from N scale to On30 because, as he puts it, “not only could I have the advantage of working with larger scale models with all the glorious detail and the latest in DCC and sound, but by sticking to narrow gauge I could squeeze continuous running onto table-top sized layouts.” Santa’s Toyland is built from extruded polystyrene foam (available in pink or blue) on a base of 1x2in pine framed by plywood. 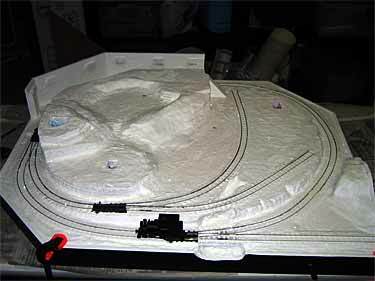 The top left photo shows how the layout looked after the scenic contours were built up from foam, the track was laid, and the whole thing was painted with Polyfilla plaster. After the plaster dried, the layout was whitewashed several times with diluted white latex paint. The magic was then added (see photo at top right). 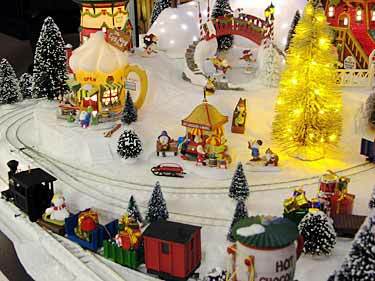 Gary’s description: “Toyland’s reason for being is, of course, Santa’s Toy Company which is the factory located at right-rear of the village. 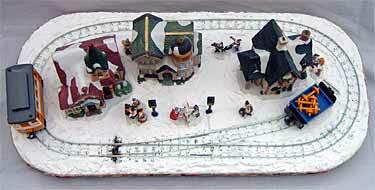 Adjacent to the toy factory, logically enough, sits the North Pole Express Depot. 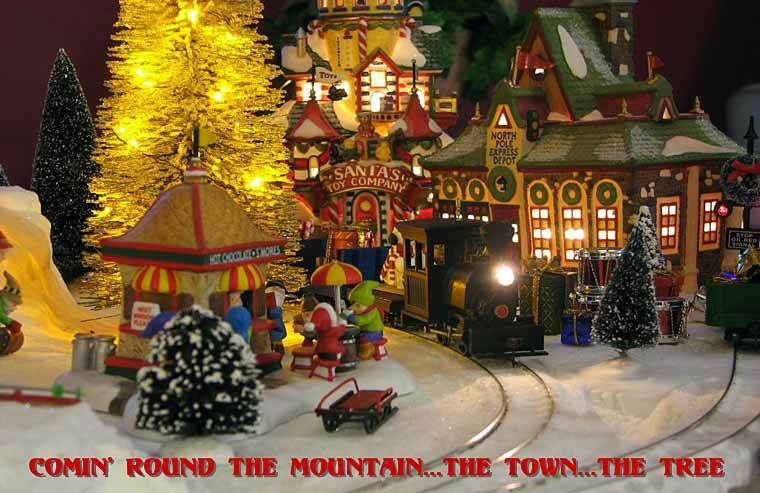 Santa’s wholly-owned branch line railway, the Toyland Express, serves the village with two rail spur lines. One spur terminates in front of the Toy Factory and is used to bring in raw materials, and the second spur located beside the Express Depot takes away the finished product. 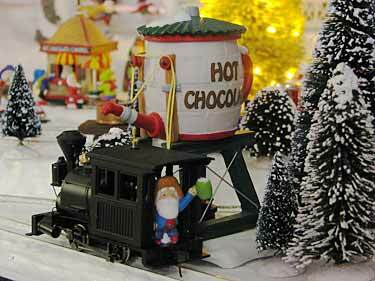 The hard-working Bachmann 0-4-0 Porter gets a fill up from the Hot Chocolate water tower located off the main track just outside the village. Once filled up with Hot Chocolate, the Porter hooks up to cars laden with finished toys and chugs down the incline of the branch line, disappeariing into the tunnel towards the interchange far-far away! What more can I say? Here are a couple extra photos. 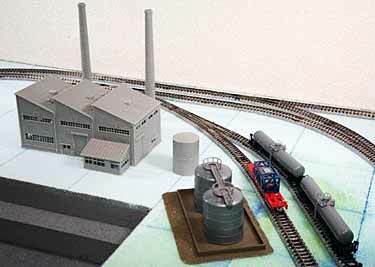 THIS N-SCALE LAYOUT, MADE IN CHINA, TRAVELED 12,400 MILES! The layout survived a three-month ocean journey in a container, housed in its special shipping box (below, right). It’s a special steel frame made in China and covered with blue, rigid plastic. It’s very light and very strong. The only damage East Peoria sustained during the grueling voyage halfway around the world was a single uprooted fir tree (since reglued)! Dennis Vaccaro, from Western Pennsylvania USA, was so taken with the idea of micro layouts that he designed three of them! 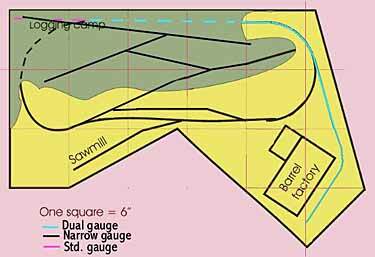 All are variations of the same basic plan — a narrow-gauge dogbone main line running from a mine to a barge loading facility on a river. An lower-level standard gauge spur also receives carloads of coal or ore from the slimgauge trains. Dennis’s ingenious designs show how this idea can be twisted and bent to fit a variety of spaces, all in no more than four square feet! The top layout is a straight bookshelf 48x10in (120x25cm); below at left is an L-shaped bookshelf for a corner, measuring 33in (84cm) along each wall; and at right below is a 24in (60cm) square version of the same basic plan. 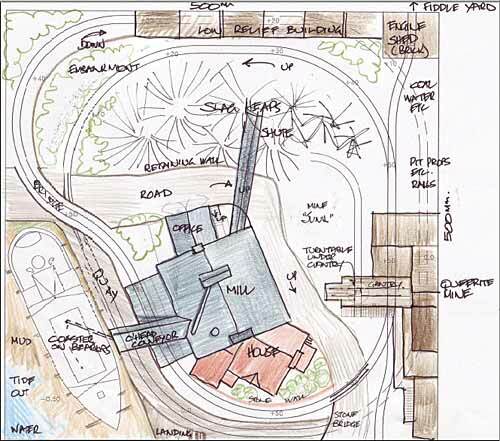 Careful examination of the differences between the plans can teach us a lot about how to adapt layout ideas! What scale is it? 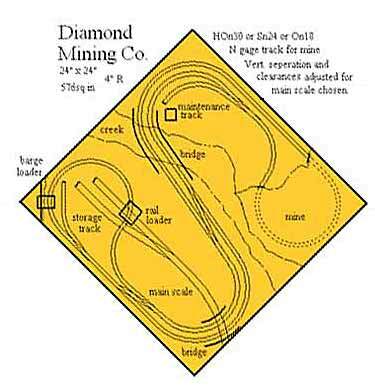 Dennis points out that in all cases, the narrow-gauge mining railway is built on 9mm gauge. It can represent either HOn30, Sn24, or On18 scales — your choice! 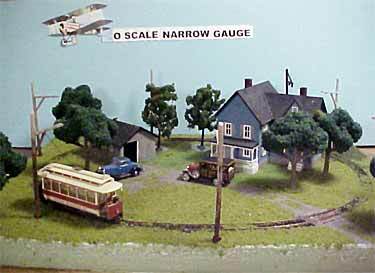 The standard gauge will vary to suit your decision. If you choose to build one of these delightful little railways, please send photos for this Scrapbook! 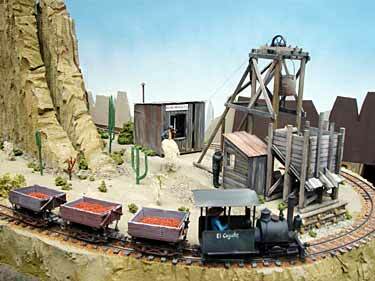 Richard Heisler, from Eureka California USA, built the Acme Mining Company, an 1/32n20 layout measuring 48x24in (120x60cm). Primary construction material throughout (including the vertical mountain view block) is pink insulating foamboard. Scale is 3/8in to the foot, representing a 20in gauge mining railroad in the tradition of the well-known Coronado RR and the lesser-known Hackberry & Iron Queen RR from the same area of Arizona. Richard has packed in lots of atmosphere in a large scale and a relatively small space! John Henshaw, from Swan Bay, Tasmania Australia, is building the Toolybuc Sugar Company , a narrow-gauge line that hauls sugar cane to the refinery, modeled after many such lines in Australia, especially in Queensland. It’s 500mm (20in) square. John has built the refinery building and come up with some convincing palm trees based on leaves of the Australian Acacia Baileyana plant (called mimosa in many other places). 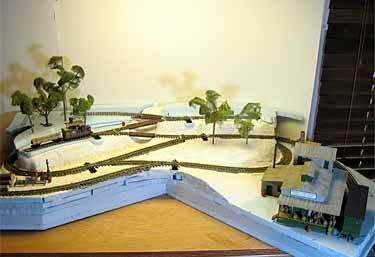 John has kept the trackwork simple, because what he likes to see “is a diorama that is detailed and captures atmosphere and which just happens to have trains occasionally moving through/in it.” Another of his designs is shown below. The Curiousite Mineral Tramway is a compact line that brings the raw Curiousite-bearing rock down from the mine to the quayside crushing plant. It also measures 500mm (20in) square and is 500 mm tall (to the top of the backdrop). A twice around loop with some concealed portions provides continuous running. John’s pen-and-ink drawing of the quayside mill and loader is shown below. 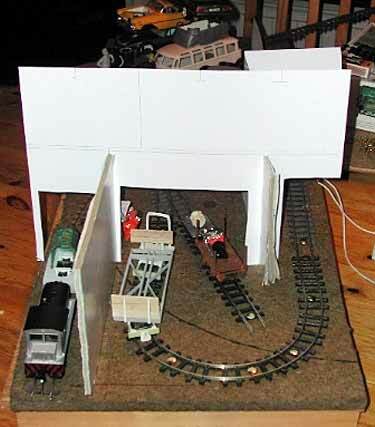 Peter Laband, from Redditch, England, continued his ways of using “toy” materials to make model railways (last visited in the July 2006 Scrapbook) by building this Christmas layout using rolling stock converted from LGB Gnomy push toys and inexpensive scenery from a local store.Peter reports, “This layout is built around a very cheap set of Christmas decorations from a local hardware store. There are three ceramic buildings (which light up via bulbs and an included transformer) with a few groups of figures that seem to be made of some plaster like substance. These were glued down with a tub of ready mixed tile cement (from the same hardware store) onto a board (aprox 11×21 inch plywood offcut) along with a loop of Peco Streamline OO/HO flex track with a single turnout into the station. The curves are a very tight radius!”The motive power is a Gnomy tram car, a push toy that Peter eviscerated and added a motor unit from a Bachmann Brill trolley. He also transplanted the bulb from the Brill into the front of the Gnomy car. “In the evening,” says Peter, “with the lights on in the houses and the yellow tram with its bright headlight whizzing round, this layout is a pleasure to watch.” Looks good to me, too! Tada Noriya (“Nori”), from Japan, is building this 2x3ft (60x90cm) N-scale layout that depicts an industrial district highlighted by rice warehouses alongside a canal. 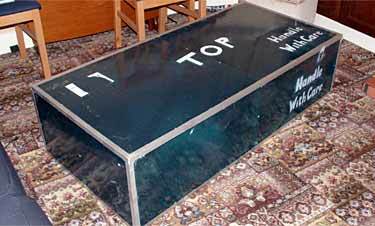 Nori started with three slabs of styrofoam, sandwiched to provide a 3-1/2″ thick baseboard. One part is cut away to represent the canal.Nori likes this compact plan because it allows both industrial switching and continuous running. He’s using a virtual-reality drawing program called VRM4 to plan the scenery, and several drawings made with that program are included here to illustrate how it can help in planning layout construction. 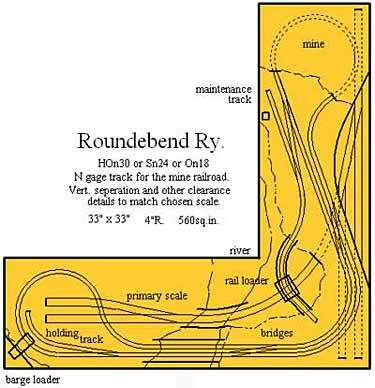 In particular, the mainline bridge over the canal must be sited on a tight curve, as shown in the VRM4 drawing below, at the upper right. This created a problem, because Nori likes to run 66-foot flatcars on his line, despite the small dimensions of the layout. Those cars have a lot of overhang that tends to foul the bridge trusses.Nori’s solution was to construct a curved truss bridge, just wide enough to clear the long cars (see lefthand photo below). How he did it is chronicled in his railroad blog — along with a detailed day-by-day chronicle of his progress, which is continuing! The lower right photo below shows industrial development beginning to appear alongside the spur tracks. 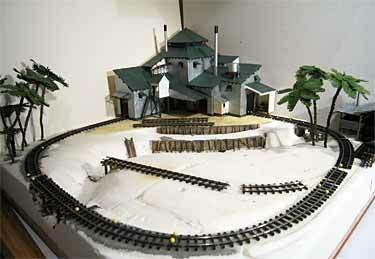 Last month, I asked about ingenious ideas to help trains exit a modeled scene inconspicuously, to get to the fiddle yard. Here is a radical departure from most methods I’ve seen. 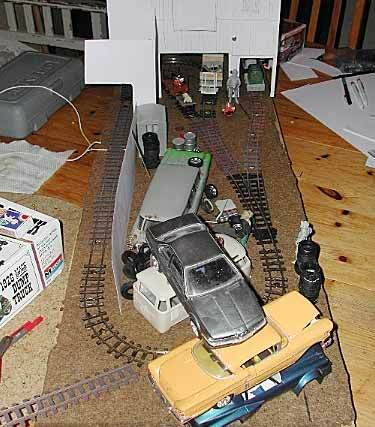 Hans Hammarsten, from Västerås, Sweden, is building Crazy Hank’s Junk Yard on a 100x35cm (39x14in) baseboard in Hn15 scale (1:24 running on 16.5mm gauge). Note: this scale/gauge combination is often referred to as Gn15, the “G” being somewhat loosely defined hereabouts. Hans’s idea for exiting the scene? Trains leave our sight through a large junk pile, mainly made up of automobile carcasses, heaped at the left end of the layout! Hans piled some stuff to show the effect in this mockup version, but the final layout should be even more effective! 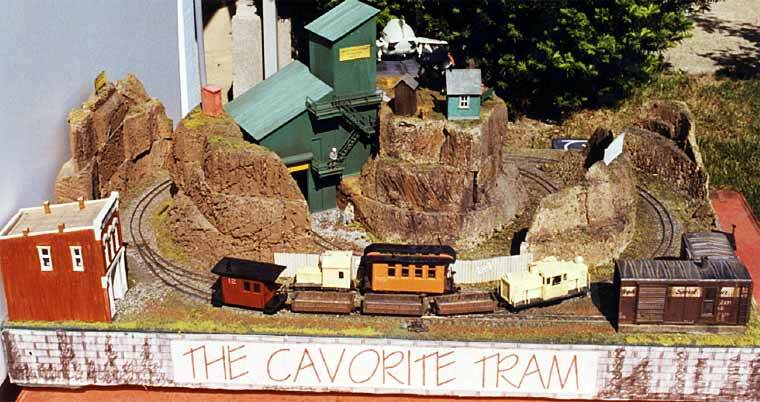 I have to confess that I really like the idea of modeling great mounds of interesting junk through which a tiny train can maneuver back and forth. (See Scrapper Sid’s in the Micro Gallery.) I hope to bring you photos of this completed layout when the time is ripe. MJ Idzerda, from London, Ontario Canada, adopted a 22.5x35in (57x89cm) bulletin board to build his UK-inspired N-scale layout. It will sit on his desk when operating, and he’s building in the flexibility to interchange British and Canadian equipment and buildings “whenever the mood strikes.” This little line, as yet unnamed, is a good example of the pleasures that can easily be provided by small layouts. 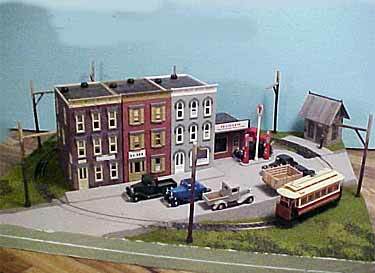 Russ Haigh, from Willoughby, Ohio USA, is an old hand at building small, circular layouts (see his Pelican Phosphates layout in Scrapbook #38). 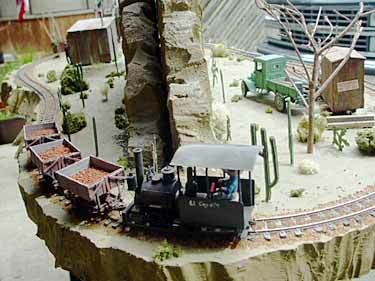 Recently he sent me a couple photos of his very first micro layout — a 20x30in (50x76cm) railway called The Cavorite Tram, a mining line which he concocted sometime around 1995. Cavorite is an imaginary mineral invested by H.G. Wells with the uncanny ability to fall upwards. Wells used it to power a voyage to the moon. 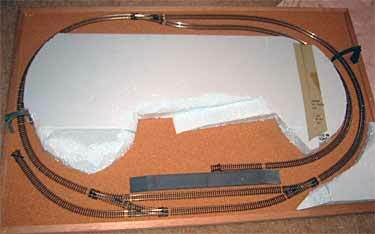 “The trackplan was drawn on the foam, and Campbell HOn3 profile ties (sleepers) were attached with wood glue. Since foamcore doesn’t hold spikes, the rail was pre-bent to an approximate curve and the bottom of the rail was coated with (I think) hot craft glue. The rail was placed on the ties, and a soldering iron was used to re-melt the glue and bond the rail to the ties. The second rail was placed using a 9mm track gauge, turnouts were built and the thing actually ran! Locomotives were a couple N gauge diesel conversions. 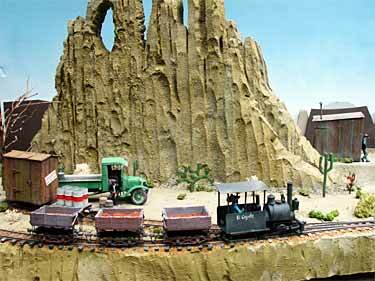 Ore cars were Grandt Line On2 Gilpin Tram cars and some Tomy N gauge side dump gondolas. “Scenery was built up from more pink foam and carved and painted. An enginehouse/office was bashed from a standard gauge boxcar. 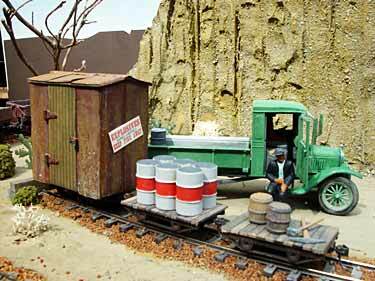 A company store appeared and the Cavorite Mine was scratchbuilt from corrugated sheet styrene. The Cavorite could be shipped out by rail or flown out from the airport atop the mountain in Cavorite conversion aircraft. (The aircraft are egg models from Hasegawa.) The airport had an office and an outhouse that was guyed down to avoid being blown over by departing flights. And the rest is history. 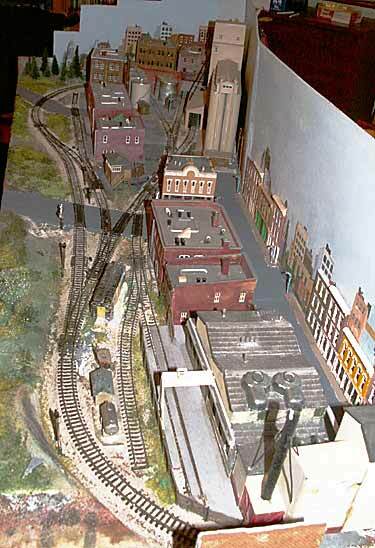 Russ went on to win awards for small layouts, and is still at it in his Ohio workshop. Watch this space for further developments! Stumpy Stone, from Martin’s Ferry, Ohio USA, is a frequent contributor to these pages (yes, he does know Russ Haigh, above). 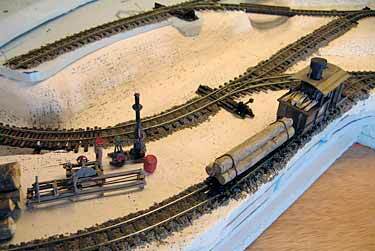 Stumpy built this 34x50in (86x127cm) layout as an experiment in S scale, standard gauge (1:64 running on 7/8in or 22.2mm gauge). He built it as a display for the S Spree this year (an S scale train meet in Ohio). 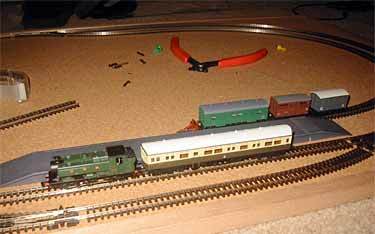 Stumpy uses can motors in his locos and runs on DC power using a Bachmann HO power pack.. 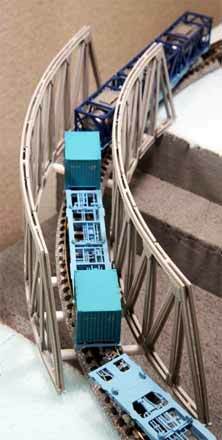 While American Flyer trains — the original S-gauge rolling stock — are AC powered, many S gauge operators are converting to DC power as it allows slower and smoother running than AC. The buildings are cast resin and scratchbuilt. The vehicles are modified units by Hartoy, Johnny Lightning and Matchbox. Stumpy observes that very small layouts are something new to most folks in S scale. I hope we can expand their use of this engaging idea that saves time, money and space, and provides very satisfying railroading! 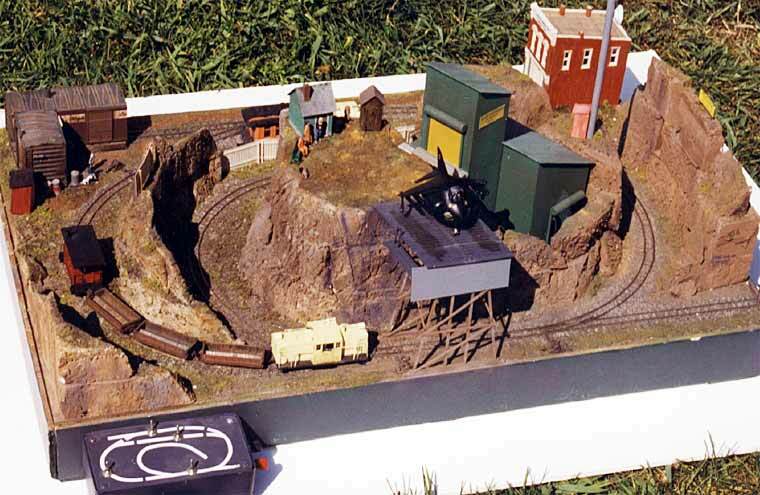 Awhile ago, John Hubbard, from Huntsville, Alabama USA, published a list of his “giv’ns and druthers” (he calls them “parameters”) for a new layout and asked for ideas and conceptual designs. 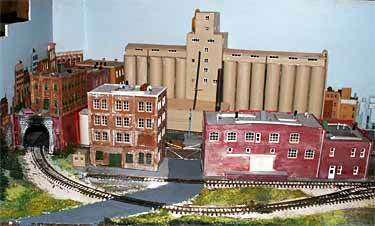 Principle requirement was that the layout needed to showcase both a sawmill and an existing Campbell HO model of the Richmond Barrel Works (originally an O scale building by Frank Ellison). A number of modelers sent ideas to John, including Art Papaynanopulos, Jack Trollope, Donald Kinney, Jon Songøygard and Larry Smith. 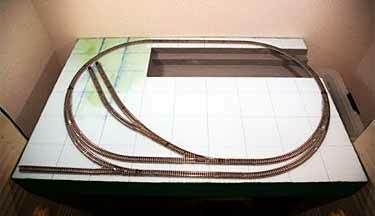 You can see John’s parameters and their suggestions on John’s website.Ultimately, John chose to work with Art’s basic 2x3ft layout idea, modifying it somewhat (upper left) in the process — in particular, he made it a dual-gauge HO/HOn30 design. The switchback [zig-zag] pattern across the center of the layout to reach the logging landing at the top left was especially challenging, and John spent a lot of time juggling pieces of blue foam board and arranging tracks. His final mockup is shown in the upper right photo.Now named the Viduta Timber Comany Railroad, the layout is beginning to take shape. It was named for a small town atop Monte Sano, the “mountain” on the east side of Huntsville. Its function John describes as “to transport logs from a large stand of trees on the side of Monte Sano down to a sawmill by Fagin Springs Creek, where the timber is sawed for market. Much of the sawn lumber will be transported to Huntsville and beyond, but some is delivered to the Richmond Barrel Manufacturing Company where it is made into barrels, kegs, etc. 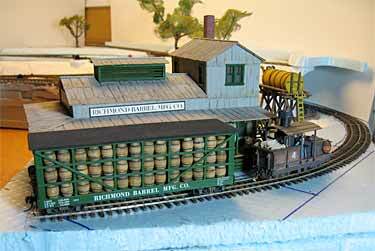 Those products are delivered to market on Richmond Barrel’s private car, a 40-foot standard gauge truss-rod car especially built for hauling barrels. The dual gauge track at the barrel works allows the narrow gauge logging line to deliver raw materials and the standard gauge line to take the finished products to market.”The two shots below are closeups of John’s initial mockup and show the line’s two most-prominent pieces of rolling stock — a narrow-gauge climax lokey that John built using a Con-Cor N diesel switcher and a Mark Rollins Class A Climax kit; and the standard-gauge barrel car, from Ye Olde Huff-n-Puff (which old-timers fondly remember as one of the first producers of delightfully different HO cars). We hope to bring you more developments of the Viduta Timber Company RR as they appear. Stay tuned! You can see more about this mockup stage of the layout on John’s website.